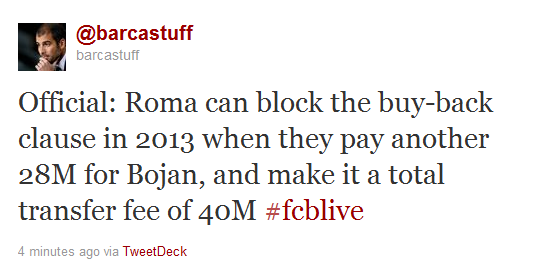 Bojan learns to live away from Barcelona in Rome, a city that has everything for fast adaptation. Justin Bieber packed the Palau Sant Jordi for his concert on Wednesday, despite it being on the same day as Barça v Shakhtar, and watched them train today after admitting that he is a fan of the team. The 17 year old Canadian even donned the team’s second strip and appeared on the pitch at the Ciutat Esportiva, kicking the ball around and even joining in with a quick game with some of the players once it was over. In that game, Justin Bieber, Thiago and Benja played against one of the singer’s friends, Bojan and Fontàs. All played into the same goal defended by Rubén Miño, and Bieber showed surprisingly decent skills with his left foot. Argentine Mascherano, who has largely been used as a back-up player for the Catalan side this season, is seen as an ideal purchase for Juventus, according to Marca.com, as they look to rebuild for next season in the wake of yet another disappointing campaign. What do you guys think? Masche and Bojan to Juve? Reportedly the club is really to spend 100£ million this summer on transfers. Is it possible a barça player will join them? Bojan Krkic was interviewed on the Barça TV programme ‘Estació Camp Nou’ and he admitted Guardiola’s `positive influence on him and expressed his confidence in being able to get more minutes on the pitch.